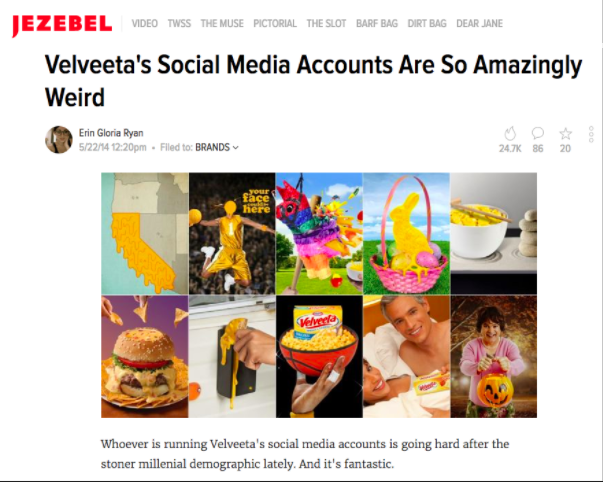 Velveeta needed a social media presence that would not only speak to moms (their primary consumer), but their shells and cheese buyers as well... who tended to be younger dudes. When it comes to social media behaviors, there are few ways these two groups overlap. We tapped into moms' irrational love of our cheese, while tapping into dudes' irrational sense of humor. And so, our "amazingly weird" and newsworthy social voice was born. Our unique blend of mom- and dude-oriented humor quickly captured the attention of both industry and cultural news. We saw staggering earned media not only in mom blogs like Jezebel, but in dude blogs like UpRoxx and High Times as well. Oh, and we got lots of love within the ad industry too.